> Saints score a goal - two even! Saints earned a valuable win at already relegated Middlesbrough, with goals from Jay Rodriguez just before half time and a glorious strike from Nathan Redmond shortly after the break. If Shane Long had tucked his 60th minute penalty away after 'Boro keeper, Brad Guzan, had brought the Irishman down, then this game would have been done and dusted. Unfortunately Long blasted the ball against the top side of the bar and over into the crowd behind the goal. 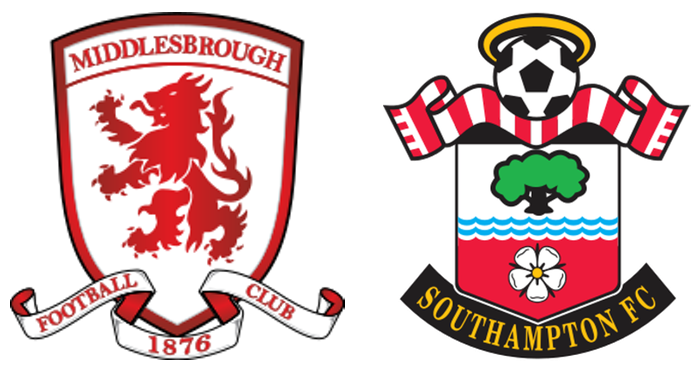 Patrick Bamford then pulled a goal back for 'Boro with a fine header from a corner kick and the remaining few minutes were very nervy, especially when ex-Saint, Calum Chambers drew a fine save from Fraser Forster. The team clung on for a very valuable three points. When the sides were announced and hour before kick off there were general gasps of amazement at all the changes, no fewer than seven. In was Pied at right back, Cáceres at CB alongside Yoshida, Clasie and Højbjerg joining Romeu in midfield and Long, Rodriguez and Boufal up front. Pretty adventurous rotation on a grand scale then. The personnel may well have changed, but the game began with Saints playing that patient build-up that has become so familiar to fans this season. Yet the first goal before half-time was as a result of rapid play, with the underrated Clasie finding Long on the right, who in turn slotted the ball through the non-existant Middlesbrough defence to an unmarked Rodriguez no more than three yards out. It looked so simple. Too often this season Jay Rodriguez has looked a peripheral figure on the edges of the Saints first team, underused and unappreciated and it seems likely that he will leave this summer. Shame. After the break, Claude Puel replaced Boufal with Nathan Redmond and this turned out to be a masterstroke, as the Englishman went on to terrorise the 'Boro defence down the left. The second goal came from one if these moves, with Redmond cutting inside and curling a tremendous shot into the top right corner of the goal, beyond Guzan's reach. It was only Nathan's 6th league goal this season and you just feel that there is so much more to come from him. Then, on about the hour mark came the moment that really should have wrapped the game up, Bertrand found Long from the left and Brad Guzan rushed off his line and only succeeded in rather clumsily bringing Shane down in the penalty area. The referee, Anthony Taylor, pointed straight to the spot. Rather strangely, the home fans were calling for the referee to send Guzan off. Long struck the ball hard and it struck the top of the bar and disappeared into the crowd. He sank to his knees, with a wry smile on his face. Ten minutes later Middlesbrough won a corner which was taken by the substitute, Fischer and the ball arrowed towards the head of Bamford. The forward hadn't scored for more than thirty games, but the header was perfect and 'Boro were back in the game with just over twenty minutes to go. Middlesbrough were not able to equalise, but it was a close run thing, with Fraser Forster having to be at his best to deny Calum Chambers in the dying embers of the match. Three minutes before the end of normal time Shane Long was replaced by the returning Charlie Austin, to rapturous applause from the Saints fans in the away section. Welcome back Charlie, shame he wasn't around to take the earlier penalty. It was interesting to see Cáceres finally playing and he was clearly not match fit and made a couple of mistakes, which could have proved costly against a better side than Middlesbrough. Will we see him again? Pied looked decent at right back and that was some achievement, considering he has missed almost the entirety of this season with injury. As for the other replacements, Clasie showed why he needs to remain with Saints, showing fine vision with his passing and not a little tenacity. Højbjerg showed glimpses of promise again, but he is undoubtably a player that needs a run in the side to eliminate some of the more fragile sides to his game. Boufal disappointed, but I think he just needs a pre-season and like Højbjerg, needs to play on a regular basis. In his case though, he just needs to get accustomed to the Premier League. So, Saints 2016-17 away campaign drew to a close, with a win and three welcome points. The club are back up to ninth in the League with two games to go and level on points with West Brom. Eighth place is still there for the taking. Next up, Manchester United at St.Mary's on Wednesday evening. Nathan Redmond. Not much doubt in my mind. In spite of only playing in the second half, he just showed his quality by topping off an excellent display with a stunning goal.